In 1848 William Pfaender left Germany, headed to the United States. His path took him to Cincinnati, where he played a central role in the growing American Turner movement. Then, in March 1855, in the wake of widespread mob violence against German Americans, Pfaender called for the creation of a Turner settlement society. That letter would lead to the founding of the city of New Ulm, Minnesota. He became a leading citizen of that town, a heroic officer during the Civil War, and Minnesota state treasurer. 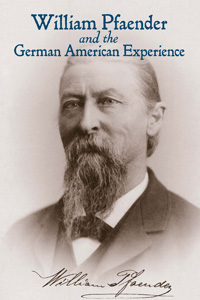 In this book, two German writers, Hans Muller and Annette Hofmann, look at Wilhelm Pfaender's life from the perspective of his native homeland, recognizing the significant place that he holds in German American history.